Get some historical perspective at Fort Rosecrans Cemetery and Embarcadero. 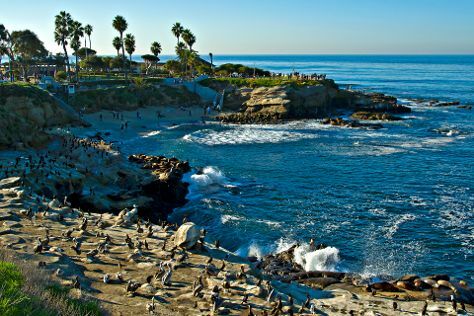 Get in touch with nature at La Jolla Cove and Old Town San Diego State Historic Park. Next up on the itinerary: meet the residents at San Diego Zoo, see the interesting displays at USS Midway Museum, identify plant and animal life at Torrey Pines State Natural Reserve, and step aboard Maritime Museum of San Diego. For traveler tips, more things to do, photos, and tourist information, you can read our San Diego trip planning website . Fort Lauderdale to San Diego is an approximately 7-hour flight. You can also do a combination of train and flight; or drive. The time zone changes from Eastern Standard Time to Pacific Standard Time, which is usually a -3 hour difference. Plan for a bit cooler temperatures traveling from Fort Lauderdale in June, with highs in San Diego at 73°F and lows at 64°F. Finish your sightseeing early on the 11th (Tue) to allow enough time to travel to Carmel. Popular historic sites such as Alcatraz Island and The Embarcadero are in your itinerary. Satisfy your inner culture vulture at Fisherman's Wharf and Twin Peaks. The adventure continues: take in the views from Golden Gate Bridge, enjoy the sand and surf at Baker Beach, look for all kinds of wild species at Fort Funston National Park, and take a stroll through SoMa. To find ratings, other places to visit, more things to do, and more tourist information, read San Francisco journey planning tool . You can fly from San Diego to San Francisco in 3.5 hours. Other options are to do a combination of flight and train; or drive. Traveling from San Diego in June, plan for a bit cooler nights in San Francisco, with lows around 55°F. Wrap up your sightseeing on the 15th (Sat) to allow time to drive to South Lake Tahoe. On the 16th (Sun), explore the galleries of Tallac Historic Site, admire the striking features of Vikingsholm, and then contemplate the waterfront views at Emerald Bay State Park. Keep things going the next day: enjoy the sand and surf at Pope Beach, kick back and relax at Baldwin Beach, and then immerse yourself in nature at Van Sickle Bi-State Park. To find maps, ratings, more things to do, and other tourist information, use the South Lake Tahoe trip itinerary planner. Drive from San Francisco to South Lake Tahoe in 3.5 hours. Alternatively, you can do a combination of flight and bus; or do a combination of train, flight, and bus. When traveling from San Francisco in June, plan for somewhat warmer days and little chillier nights in South Lake Tahoe: temperatures range from 77°F by day to 41°F at night. Wrap up your sightseeing on the 17th (Mon) early enough to travel to Yosemite National Park. Take a break from the city and head to Tuolumne Meadows and Glacier Point. 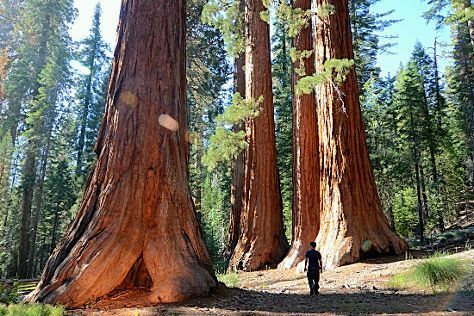 The adventure continues: hike along Mariposa Grove of Giant Sequoias, stroll through Panorama Trail, explore the striking landscape at Lembert Dome, and take in the dramatic scenery at Yosemite Falls. To see reviews, maps, traveler tips, and other tourist information, refer to the Yosemite National Park trip planning tool . You can take a bus from South Lake Tahoe to Yosemite National Park in 6.5 hours. In June, plan for daily highs up to 79°F, and evening lows to 43°F. Wrap up your sightseeing on the 22nd (Sat) to allow time to travel to Los Angeles. Kick off your visit on the 23rd (Sun): take a leisurely stroll along Santa Monica Pier, enjoy the sand and surf at Venice Beach and Boardwalk, appreciate the extensive heritage of Venice Canals Walkway, then see the interesting displays at The Getty Center, and finally get to know the fascinating history of Hollywood Walk of Fame. On the next day, enjoy the sand and surf at Santa Monica State Beach and then listen to music at Walt Disney Concert Hall. To find maps, other places to visit, ratings, and other tourist information, go to the Los Angeles day trip planner . You can do a combination of car and flight from Yosemite National Park to Los Angeles in 4.5 hours. Other options are to drive; or do a combination of bus and flight. Plan for a bit warmer nights when traveling from Yosemite National Park in June since evenings lows in Los Angeles dip to 62°F. Finish your sightseeing early on the 24th (Mon) to allow enough time to travel to Sedona. On the 25th (Tue), take in the dramatic natural features at Cathedral Rock, take in the exciting artwork at Exposures International Gallery of Fine Art, and then soothe aching muscles at some of the top local wellness centers. Get ready for a full day of sightseeing on the 26th (Wed): explore and take pictures at Walnut Canyon National Monument. To see photos, ratings, more things to do, and more tourist information, you can read our Sedona trip tool . Fly from Los Angeles to Sedona in 4.5 hours. Alternatively, you can do a combination of flight and shuttle; or drive. The time zone difference when traveling from Los Angeles to Sedona is 1 hour. 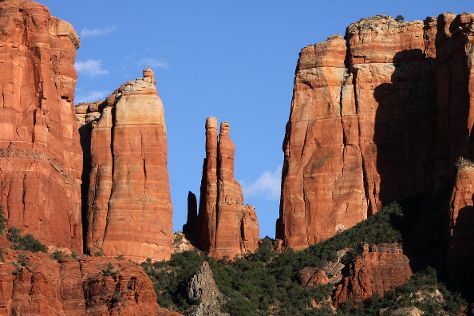 Traveling from Los Angeles in June, expect Sedona to be a bit warmer, temps between 94°F and 68°F. Wrap up your sightseeing by early afternoon on the 26th (Wed) to allow time for the car ride to Las Vegas. On the 27th (Thu), identify plant and animal life at Lake Mead National Recreation Area, then shop like a local with The Strip, and then ponder the design of Bellagio Fountains. Keep things going the next day: stroll through Spring Mountains Visitor Center, then enjoy breathtaking views from High Roller, and then admire the natural beauty at Bellagio Conservatory & Botanical Gardens. Drive from Sedona to Las Vegas in 5.5 hours. Alternatively, you can do a combination of taxi and flight; or do a combination of shuttle and flight. The time zone difference moving from Mountain Standard Time to Pacific Standard Time is minus 1 hour. Expect a bit warmer temperatures when traveling from Sedona in June; daily highs in Las Vegas reach 103°F and lows reach 77°F. Wrap up your sightseeing on the 28th (Fri) early enough to travel to Grand Canyon National Park. Start off your visit on the 29th (Sat): add some entertainment to your itinerary with Hopi House, hike along South Kaibab Trail, and then cruise along East Rim Drive. 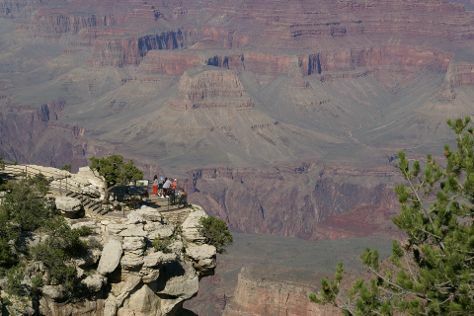 Keep things going the next day: get great views at Mather Point and then trek along Rim Trail. For where to stay, photos, other places to visit, and tourist information, read Grand Canyon National Park tour planner . You can do a combination of car and flight from Las Vegas to Grand Canyon National Park in 4.5 hours. Alternatively, you can drive; or take a shuttle. Due to the time zone difference, you'll lose 1 hour traveling from Las Vegas to Grand Canyon National Park. When traveling from Las Vegas in June, plan for a bit cooler days in Grand Canyon National Park, with highs around 85°F, while nights are colder with lows around 42°F. Wrap up your sightseeing by early afternoon on the 1st (Mon) to allow time for travel back home.